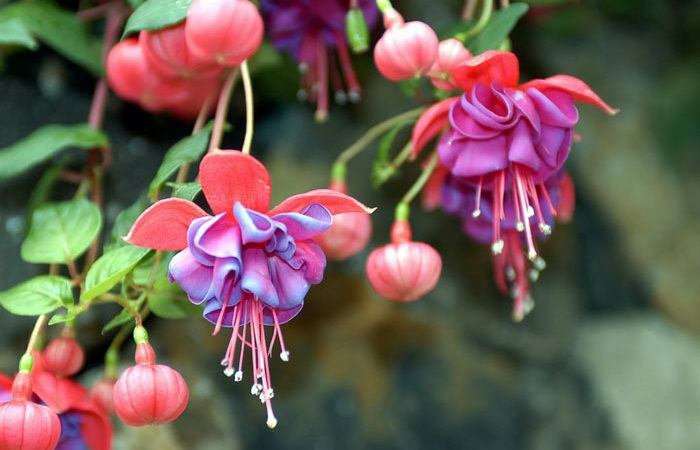 Fuchsias are shrubs and in mild districts the hardiest kinds, such as F. magellanica and its variety riccartonii, are used for hedges. But most of the hybrid forms grown are not so hardy and are treated as disposable bedding plants or plants for a ‘cool green­house, apart from the warmer parts of the country. They are readily trained as bushes, cascades, standards and other more elaborate shapes. Their interesting hanging flowers are varied in size, form and color and there is a multitude of varieties, varying in habit. Soft wood cuttings root readily. Those of hardy kinds are taken in spring, as are also those of greenhouse ones needed for making standards or pyramids or small plants to flower later the same year, but the bulk of greenhouse ones are made in mid-summer for growing through the winter in a minimum temperature of 55°F (13° C) to flower from May onwards. Soft wood cuttings are made by removing the top few inches of soft growing shoots. Ideally such a shoot should not have flower buds, but as the tip will be pinched out (stopped) soon after rooting this is not essential. The stem is cut with a razor blade straight across just below a node (leaf joint) and the bottom two pairs of leaves are carefully removed. 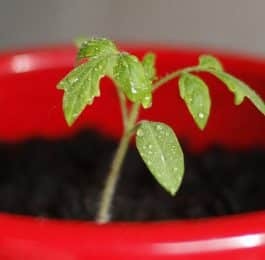 The base is dipped in a hormone rooting powder and pushed into the cutting bed or pot, containing pure sand or a mixture of two parts of sand and one of peatmoss, which gives better results as the brittle roots are less liable to be broken when removed for potting. Cuttings will normally root in 3 to 4 weeks and should be potted singly into 3-in. pots of general potting compost or a soilless compost. As soon as they are growing again freely the top of each plant is removed, leaving only the two bottom pairs of leaves. 1/2 part dried cow manure, 1 part sand, plus bone meal. Standards and other top heavy plants must be in a loam based compost to help keep them stable. During the summer shoots may be shortened to two nodes again and again to make a bushy plant. However, as it takes six weeks from stopping to flowering on a side shoot, do not go on stopping too long. Cuttings destined to be trained as standards should be stopped once. The best side shoots are then tied to a cane, the others removed. Standards The best standards are not made from the stiff upright types but from the vigorous growing pendulous ones, therefore the trunk of the standard needs to be tied in straight at all stages. To make a head on top of a given length of trunk grow the stem at least two or three further nodes and then rub out the top. The growths from these make branches from which the head is formed as if it were a bush. Side shoots which appear lower down should be rubbed out at once, but the leaves growing from the trunk should be left to make food for growth. Half standards make good table decorations in a sun parlor, but fuchsias do not like being moved into overheated, draughty or poorly lit places and usually drop their flower buds. They are fine in window boxes and on terraces and patios, as well as bedded out, preferably in beds by themselves. The pendulous varieties, known as basket or cascade forms, are stopped as for bushes, but put the pots on other inverted ones to keep the growth above the bench. Or the plants can be grown in hanging baskets suspended from greenhouse rafters, or from the rafters of patio, porch or pergola or a bracket from a wall. The soft growth of even the hardy fuchsias may be killed by frost in colder areas, but new shoots will usually shoot up from below ground the following spring. When planting scoop out a shallow depression in which to put the plant and after it is growing well gradually return the earth so that the base of the stem becomes covered, then in the fall put on a good top dressing. The small mound will help to protect the basal buds. Plants to be housed during the winter in a frost-proof place should be lifted immediately frost has cut the leaves, and stored almost dry until March when they will start into growth if moved into warmth and watered. F. magellanica riccartonii, erect, branching, [S] scarlet, purple. pumila, very small, scarlet and mauve. ‘Susan Travis’, erect, [S] rose pink. ‘Tolling Bell’, scarlet, white, large bell. ‘Torch’, cream flushed salmon, salmon shading to red. ‘White Spider’,  white flushed pink, white. ‘Winston Churchill’, [D] pink, silvery blue, compact.